This was the message from Ian Ohnstad, Milking Technology Specialist from The Dairy Group, who addressed delegates attending the recent MEA (Milking Equipment Association) conference in Birmingham. “The average UK herd size is now over 140 cows, and as herds increase, the costs of breakdowns have greater financial implications on a dairy farm business, as well as significant disruption to daily routines. Down time between milkings can be minimal in todays modern units, and therefore how we ensure consistent parlour performance needs to adapt. “There will always be an essential need for a on-farm parlour testing service, however as part of their support service going forward, technicians will need to have access to data – looking at milking information and parlour and component performance – to analyse, diagnose and resolve problems, without a physical visit. From a farmer’s perspective, this also illustrates the need for an industry accreditation – Parlour Safe in the UK – so we have total confidence in the ability of the technician when advising. This is recognised throughout the world, as dairy farms become larger and the demand on the milking equipment becomes higher. “On many large-scale operations, there simply isn’t the capacity in the system to allow for a breakdown. Also, the implications of a poorly operated machine are significant. Teat damage has health and welfare implications, can affect milk quality and also increase mastitis incidence. So, we need to address this – we need to avoid defective machines and breakdowns. “There are many aspects in dairy farming that are out of our control, and I am aware that milk price volatility and Brexit are causing concern amongst farmers. However, I encourage farmers to focus on what they can control. Look at costs – AHDB report the top 25% farmers have an average cost per litre of 25.2ppl, whereas the bottom 25% are over 34ppl. Obviously, there are many variables to consider, such as labour, machinery, vet and med for example. 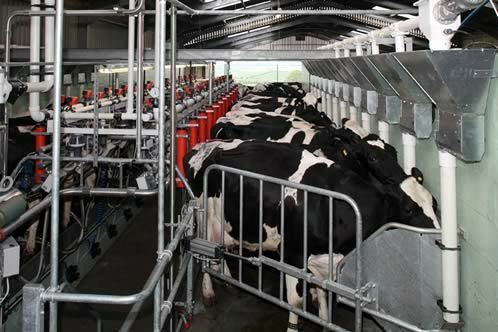 However, a cost often overlooked is parlour running costs, which vary hugely between farms. Ranging from 0.1ppl to 0.87ppl (Kingshay 2016), farmers could make some noticeable savings by simply improving the efficiencies of their parlour. And this is where a qualified technician can advise. Remote consultations offer a great opportunity for future efficiencies and I must stress the need for farmers to utilise data capture to improve parlour performance. “I also recommend an annual dynamic test which I feel is undervalued in the UK; we need to fully appreciate the relationship between the cow, the machine and the operator. We need to monitor parlour management – many problems on larger units have two legs and not four! And yet a little input can make a remarkable difference in terms of employee training and an area your parlour technician offers a valuable input,” he concludes. Other speakers at the conference included Tim Hampton from Arla Foods, who spoke about the importance of quality assurance, Charlotte Wardle from Red Tractor, Patty Clayton, Dairy Analyst from AHDB who considered the dairy market situation and outlook and Bill May, from veterinary Group, Lambert Leonard and May who presented on the benefits of correct machine installation.